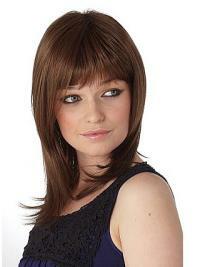 Soft layers, a full fringe and a framing silhouette defines this Wig, a sweet, classic style with fashionable features which is flattering for all face-shapes and can be worn by all age-groups. 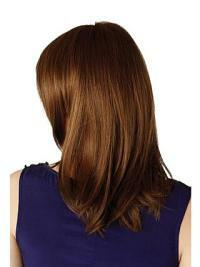 goodThis is the perfect length for somebody who wants a little bit of length without the hassles of tangeling. I wear everyday for at least 8-10hrs per day and haven't had any problems with tangeling or fizzing at the ends. She still looks great and I get compliments on my "hair" all the time. I look amazing in it!I was fortunate to get the colour I wanted. I'm naturally a redhead but colour my hair to my original colour. This colour is perfect for my complexion. It's a shade or two darker than my natural hair, but it becomes me. When I put it on, I immediately noticed I looked 20 years younger. My husband's jaw dropped when I walked out of the bedroom. Everyone says I look amazing in it!